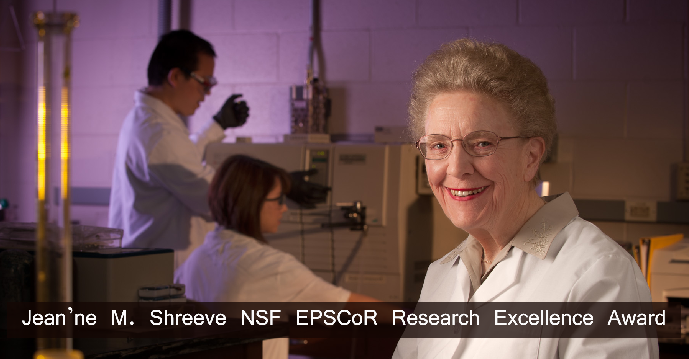 Inspired by University of Idaho Distinguished Professor Jean'ne M. Shreeve for her imaginative leadership of EPSCoR in Idaho for more than 20 years, Idaho EPSCoR established the Jean'ne M. Shreeve NSF EPSCoR Research Excellence Award. The Award recognizes the accomplishments of faculty members at Boise State University, Idaho State University, the University of Idaho or other state institutions of higher education who have previously been active participants in the NSF EPSCoR program. It highlights the substantial value of the NSF EPSCoR program to the State of Idaho, as well as the individual accomplishments of the recipient. The award may recognize a single significant contribution or an accumulation of significant contributions that have received national or international recognition. The award includes a plaque, a monetary award of at least $5,000, and an additional amount to support the cost of research or professional activities that contribute to the productivity of the award winner. Nominations of eligible faculty members can be made on an annual basis. The nomination period for the 2018 award is now open, and nominations are due by 5:00 pm Pacific Time on October 31, 2018. Please email electronic copies of the nomination materials to Rick Schumaker (rschumak@uidaho.edu).